Supermarkets own brands are, as their name suggests, basic everyday products made without a branded label like Heinz, Walkers or Kelloggs. What are own branded products? All of the major supermarkets in the UK have their own brand of goods which are cheaper versions of the products consumers would ordinarily buy. The big four supermarkets have different standards of their own brand ranging from, for example. Sainsbury’s ‘Basic’ range with an minimal standard of quality to slightly superior qualities like Tesco’s ‘Finest range’. Customers decide daily whether to pay the extra cost for a prettier label and have to make the choice on whether or not the produce is as good as the branded products they buy. There are two generic philosophies that come into play when considering whether to buy supermarket own or well known branded products, one is that you only get what you pay for and quantity grants quality. Alternatively, there is the thought of why should you pay about three times the price for a product with a colourful label and a name everyone recognises. Sainsbury have their ‘basics’ range which are similar prices to both ASDA and Tesco’s essentials range, the supermarket also have their ‘Taste the difference’ range which is their own food label with a higher standard of ingredients with a reduced price in comparison to branded products. They also have their own range of toiletries and everyday household necessities like washing up liquid, shaving gel and shampoo. For example, Sainsburys ‘Herbal Extract dry/damaged shampoo’ priced at £1.26 made in the UK is almost the spitting image of ‘Herbal Essences dry/damaged hair shampoo’ priced at £3.22 manufactured in France. It is this the consumer has to choose between these on a daily basis. 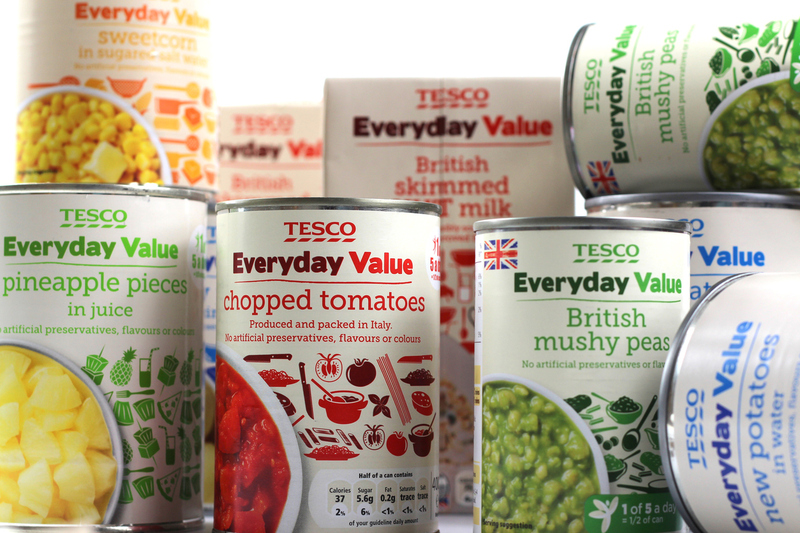 Similarly, Tesco has its ‘Value’ range, an intermediate ‘Standard’ range and their ‘Finest’ range giving their customers the choice of the quality and price they wish to spend, again the reported differences in their categories are the ingredients and how the product is presented, for example a misshapen, marked apple would only be found in their value range giving the customer the opportunity to chose the price range and standard they desire. Morrisons also has its own brand with ranges that vary on cost and supposedly standard, again it is reported that the only differences between these ranges apart from the appearance of the packaging is the variation of ingredients used and the standard that is expected of them. Marks and Spencers do not stock or sell any branded products, everything you find in the food section of the store will be their own premium brand. There are however variations you can buy with their premium range being superior to other products available. ASDA. like Sainsbury, Morrisons and Tesco have a ‘Smart Price’ range and a premium own brand from which the customer can choose depending on their budget. In addition to this ASDA tends to be slightly cheaper on branded products in comparison to the other three supermarkets that make up the ‘Big 4’ (Morrisons, ASDA, Tesco and Sainsbury). There are also the alternatives of the likes of Lidl and Aldi who have reportedly seen a rise in their turnover as a result of the economic downturn, many people report that the products purchased there are the same prices as the basic ranges available at the Big Four with the superior quality often associated with branded products. Do Supermarket Own Brands Taste as Good? There are mixed reviews on the flavours of supermarket own products in comparison to known brands, completing a blind taste test could answer this question. Trade a pack of your families’ favourite biscuits for the basics equivalent this week, put them in the biscuit tin without the wrappers and see if anyone notices any difference, if not, you know you could get them again and save a fair amount on your weekly shopping bill. Deciding whether or not to buy branded products can often have a large media influence or simply just ‘what we are used to’, if we eat Kelloggs corn flakes, the majority of people will claim that supermarket own ‘flaked corn’ is never as good. When in fact they just don’t taste the SAME as Kelloggs and consumers choosing the branded products over supermarkets own maybe simply be due to what our taste buds are used to. According to numerous self confessed ex-employees of factories where both branded products and supermarket own products are made, there are only slight differences between them. For example, Marks and Spencers reportedly only use products with a journey time from farm to product in less than three days. In comparison, Sainsbury’s allow up to seven days, this could mean it is worth paying a little more for M&S products rather than Sainsbury’s. In addition to this, employees have also reported that the differences between supermarket own and branded products are the quantities and quality of the ingredients, for example an ex-employee of Palethorpes, a company that makes things like pork pies, sausage rolls and quiches for Marks and Spencers, Sainsbury and ASDA claimed the only variations between the products that were made for the different supermarkets was the spices used in the sauces and the quality of meat. Therefore, potentially there could be variations in both the taste and the quality of the products we buy at the different supermarkets. There are a number of reasons that could explain why supermarkets can sell their own products at such a reduced price in comparison to named brands. Firstly, supermarkets are manufacturing the products for themselves, and so don’t need to pay for distribution costs, advertisements or for external labelling. In addition to this they can manufacture the products in large quantities not having the worry that there will be nowhere to sell them. Finally, brands such as Heinz, can afford to have a higher profit margin as they know there will be consumers willing to pay the extra for their brand and their unique taste. In comparison this makes supermarket brands seem even cheaper. Is it worth paying extra? It is completely dependent on the consumer, their budget and what they want. There are a couple of products it may be worth paying extra for in order to get full nutrients and satisfaction with the produce, this could include meat, eggs and fish. The human body gets its energy from the food we consume so it is important to eat quality food to keep running smoothly. It is not necessarily required to buy 100 percent organic but buying the best you can afford could be beneficial. Cheap meats from the supermarket are often chewy and tasteless, for a little extra money there are much better options available. When buying chicken in particular, it is always best to opt for free range as opposed to battery-farmed produce, not only will it taste a lot better you will also have the peace of mind the chicken had a slightly better life than some. Also it is often better value as the battery chickens are plumped up with water which just evaporates when they are cooked leaving the consumer with little more than skin and bones. Similarly, most consumers will agree that free range eggs are normally a better quality and taste much nicer than the battery-farmed alternatives with little difference in cost; customer satisfaction could easily outweigh the extra expenditure. Is it worth paying extra for luxury toilet roll? With the likes of Andrex and Charmin competing for the softest loo roll is it worth slacking on the payment and opting to use cheap paper that would arguably be put to better use as an industrial sander? There are mixed opinions on this topic – some see it as why would you pay any extra for a brand name when all the product is being used for is to wipe your bum but the other side of the coin regards cheap toilet paper as a false economy seeing the basic paper quality as being “only good for making the bowl splash-proof”.